Miss Princess and Miss Precious are very unique special girls. Traveling and sharing their many talents including painting pictures, playing instruments and much more help them share their unconditional LOVE with everyone. I have found that there are many who have no knowledge of the miniature horse history so I continue sharing the stories so they will go on. A well known but not often told story about in 1913 there were over 70,000 miniature horses underground in Wales England and Britain's mines except they called them Pit Ponies. Interestingly enough some of the American Miniature Horses today are descended from the bloodlines of these Pit Ponies. The Pit Ponies used to live underground in stables and work for 2 to 3 years at a time and usually weighed about 200 to 300 pounds and could pull about 10 times their weight. It is believed that the one of last Pit Ponies passed away in 1999. Miss Princess & Miss Precious, and Miss Pretty Dam is Peppy and their sire is Dirty Harry they were all born here at The Homestead. Miss Princess and Miss Precious both perform at a lot of events were they do some very talented special performances including painting pictures, sitting on benches, laying down, and much more. Miss Princess and Miss Precious travel every year to different Nursing homes, Assisted living homes, Schools, Daycares, and many other places to perform and share unconditional LOVE. Thank you to everyone! Miss Princess's first painting is on the right the sisters have painted hundreds of pictures and have became very artistic. Update in 2016 Princess and Precious both became registered Service animals. 2017 was a very busy year The Barn Yard Friends enjoyed all of our visits to our many different places this year. Every place is a great place to share unconditional LOVE! The Homestead's Caring Sharing Moments is for when things in life may change where being with your little friends are not possible anymore. Special loving times do not have to be a time of the past everyone could use a visit of unconditional LOVE!!! Our mission and passion is to bring our little friends for a visit of Caring Sharing Moments. Peppy is a miniature horse born in 2007. (shown far left with one of her earlier fillies Precious). On May 14, 2015 Peppy had a colt that was named Silver. Update 2015 Silver has a new loving family. Faith, born in 2007, is the mother of Hope. She and Hope are a mother / daughter team that pull the miniature wagon. The picture on the right is Faith and her filly from this year Cinnamon. Update 2015 Cinnamon has a new loving family. Hope, the daughter of Faith and was born in 2010. She is one of the miniature horses that pulls one of the wagons. In Spring 2015, Hope gave birth to a filly that was named Sapphire. Sapphire's sire is Dirty Harry and she was born here at The Homestead. Update 2016 Sapphire has became a registered Service animal and is doing a very important job right now by visiting many places and making new friends and providing unconditional Love. Sapphire visiting in the farm office. Queeny is a black miniature horse that was born in 2007. Pictured far right is Dozer, Queenie's baby from a previous year, and Queeny. Update 2015 Queeny's her colt have a wonderful new loving home. Dirty Harry is our Miniature Stallion, born in 2007. He has sired many fillies colts here at the farm. He is an "A" registered miniature horse. 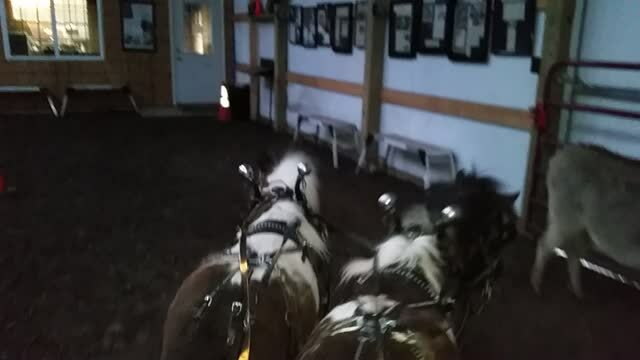 Meet April and May, they are a pair of Belgian Draft Horses. May is the mother to the Amish raised daughters shown in the picture pulling the wagon picking up hay in the field. Penny is a Belgian Draft Horse born in 2000. Penny was Amish, born, raised and worked prior to coming to The Homestead. Update 2015 Penny helped put up hay at the Amish farm spring and summer of 2015 and is due to have a foal in 2016. Magic Blessing is a true magical blessing. She is a very intelligent and athletic horse that knows many magical tricks. Magic has many registries including APHA/Pinto/NRHA. She was born in 2001. Lady Midnight has a true talent as she is our headless horseman at The Haunting. She was born in 1993 and is a solid American Paint Horse. Update 2015 Lady Midnight still performing has the The Haunting's Headless Horseman horse. 2015 the farm had a visit from Robb and the channel 8 news Thank you to the team for your visit. Brown Sugar is AQHA and Buckskin registered. She was born in 2004. In 2015 she lost her foal and became foster mother to King. King was born to Rainy, who passed away from complications of illness two weeks after he was born. King was hand fed for several weeks every few hours day & night by Cheryl. A few months later a wonderful horse known as Brown Sugar she lost her foal at birth. Brown Sugar and King were then introduced and King then became the foster colt of Brown Sugar. King was born here at The Homestead in Spring of 2015 and he is a Quarter horse. Rainy Night King, above a few weeks old and left in June 2015. Update 2016 Rainy Night King is doing awesome his mother Rainy is very missed. May is the Belgian draft horse with such a wonderful kind big heart. May pulls the wagon with April. Pictured below is Honey bee Jam her foal from 2014. May is definitely one of my special friends. Honey Bee Jam is half Belgian Draft Horse and half Quarter Horse. Her mother is May and she was born in 2014. She received her name with the help of Busy Bee Academy because their mascot is a honey bee and they were visiting the day she was born. Update for Jan. 2017 Jam is now at her new forever home with a loving family who have many awesome plans for her. Jam will be training to ride so she can enjoy many times out on amazing trial rides. Smoking Daisy is a Registered AQHA, NRHA, and Buckskin horse born in 2009. Smoking was a rescue with a strong disposition that came to the farm early 2015. Update 2015 Smoking is now performing in reining and after only a few weeks in training she received 9th at the World Buckskin horse show in 2015. Update 2016 Smoking received 7th at the World Buckskin horse show. Barbie is a triple registered AQHA/NRHA/Palomino horse. Barbie has a heart of gold and is a true friend. She was born in 2006. Update 2016 Barbie has been busy meeting lots of new riders here at the farm. New update March 2016 Barbie now has a new loving family. Bailey is a Registered AQHA gruella horse and in 2015 she foaled Blondie. Blondie was born a red dun in color and has now turned into a Palomino color. Update 2016 Bailey now has a new loving home. Kay name is special, she was named after my mom. She is a beautiful horse and very athletic. 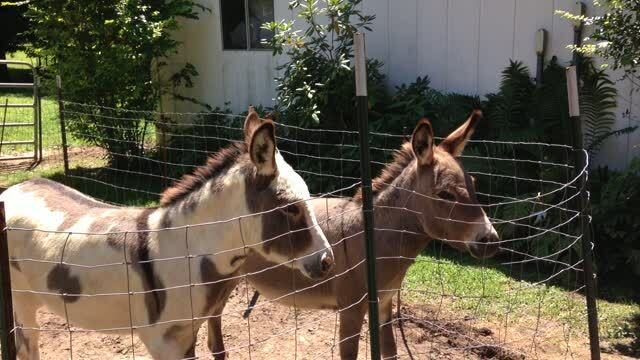 These three are miniature donkeys. The average life span is upwards of 25 years, weigh up to 350 pounds and stand less than 36 inches tall. They are intelligent, reasoning and can be loving and trainable. 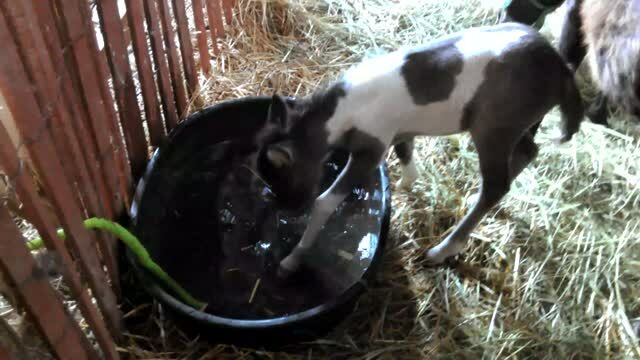 Update 2015 Minnie Mary had a miniature baby donkey her name is Blossom. 2016 update Blossom has been traveling on the bus with us all year. August of 2015 picking up Thunder and Lightning they were in need of a new home taking them home to the farm. What characters these two are. The white spotted one is Thunder and the other one is Lightning. Their long ears and expressive eyes express how friendly, inquisitive and playful they are! Update 2015 these two fabulous boys have a new loving family and are busy playing with children. Molly is not related to the other three and is also a miniature pygmy goat. Chickens and ducks at the farm. Many of our rabbits are free range, with various colors and breeds. Pictured here is our Shelby bunny, then a lion head white baby bunny and two of our black rabbits. Update 2015 four rabbits found new loving families. Arnold is a male pot bellied pig. He is very sociable and loves to talk. Daisy joined our Homestead in Spring 2015. She is a half Jersey, half Holstein cow. She adds some sweetness to the farm. Hershey is an Alpaca. Alpaca hair can be sheared, cleaned, spun and then weaved into many different useful everyday items. Hershey now has two friend Alpaca's that are girls named Amy and Chloe. Update 2015 Hershey, Amy, and Chloe have new loving homes. Serta was our first sheep at the Homestead. Big Daddy is a hairless sheep of Katadin breed. Pillow Top is one of our latest little girl lambs. Sheep with long wool can be sheared, the wool cleaned, spun and then woven to produce everyday items like blankets. Update 2015 Serta and Big Daddy now have new loving families.